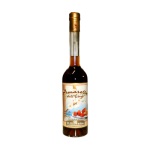 PRODUCT IN ANCIENT RECIPE THE ETNA AMARETTO HAVE THE DELICATE FLAVOR AND DISTINCTIVE FRAGANCE OF DELICIOUS ALMOND OF SICILY. PLAIN OR WITH ICE MAKES AN EXCELLENT DESSERT. THE WONDERFUL ICE CREAM, is EXCELLENT COFFEE IN 'ON AND ALMOND PASTRIES AND PREPARATION OF THE COCKTAIL.